Where Adblue is used, this needs to breakdown into ammonia, which is a thermal process. The ammonia itself can react with nitrogen in the exhaust to produce particulate matter, if the temperature is too low. The catalyst will have an optimum temperature range for conversion of NOx. From the above, it is clear that the injection of the reductant needs to be carefully controlled, especially where Adblue is chosen. 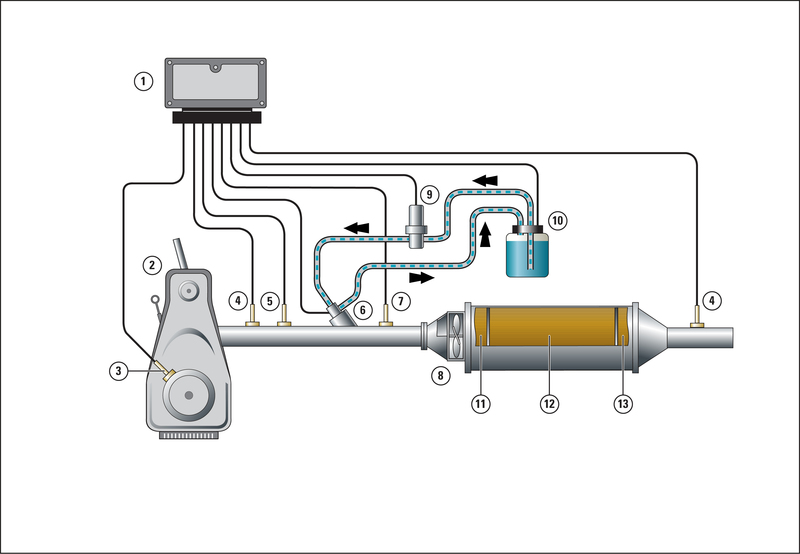 Dosing is normally managed by an ECU which is linked to various sensors for exhaust gas temperature and NOx levels. There also need to be sensors for Adblue level and quality. The choice of catalytic converter is also important, as there are various types available. The most important distinction between these is their ‘temperature window’ i.e. the graph of their conversion efficiency at various temperatures, and how this compares to the temperatures present in the exhaust gas during a typical duty cycle. Another consideration is the effect of contaminants such as sulphur in the fuel. Catalytic converters for SCR can be broken down into two groups: vanadia and zeolites, and each group has advantages and disadvantages. Oxidation catalysts. Located upstream of the SCR catalyst, an oxidation catalyst can improve the conversion efficiency of the SCR catalyst in two ways, firstly by oxidizing NO into NO2 and secondly by oxidizing hydrocarbons. These effects are most pronounced at low temperatures. Hydrolysis catalysts. These promote the breakdown of Ablue into ammonia. Ammonia-slip catalysts. Located after the SCR catalyst, the purpose of these is to oxidise any surplus ammonia. As can be seen, SCR technology is complicated and involves many variables. It is also not standing still. Whether your requirement is for a complete retro-fit SCR system, components for an OEM application or service and repair of an existing system, we will be pleased to help.